A talk event at 2016/ Shop in Arita, Japan about contemporary design and traditional craft culture. I’ll be joined by 2016/ branding manager, Hiroko Jinnouchi and one of 2016 product manufacturers. 2016 Corporation is a new contemporary porcelain tableware brand from Arita established in 2016 with 16 internal leading designers. 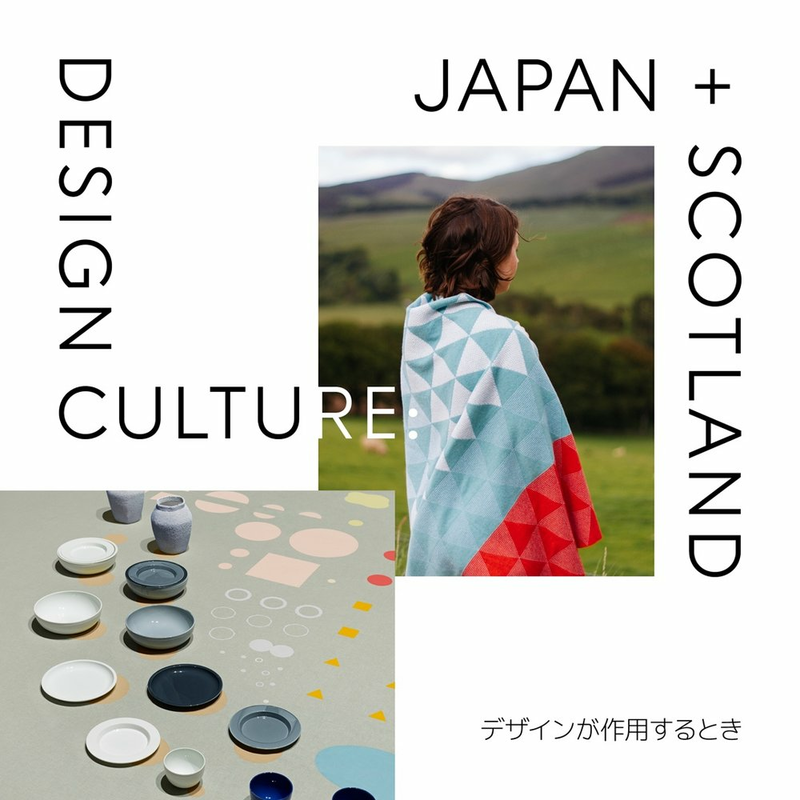 I’m currently Design Curator in Residence in both Tokyo and Arita with Arts Initiative Tokyo and Creative Residencies in Arita and one of the first participants in the Scotland/Japan Residency Exchange Programme developed collaboratively by Cove Park, Edinburgh Sculpture Workshop and Hospitalfield with key partners in Japan. The programme marks the British Council’s UK/Japan Season of Culture 2019/2020 and the 2020 Olympics in Tokyo. I’m grateful to AIT, CRIA, British Council Scotland and Creative Scotland for their support and to the Daiwa Anglo-Japanese Foundation, the Great Britain Sasakawa Foundation, Saga Prefecture International Affairs Division and the Agency of Cultural Affairs, Japan. My summer show Made in Glasgow by Local Heroes – was a temporary design exhibition and shop at 58 Albion Street in Glasgow’s Merchant City produced to coincide with the Berlin/Glasgow European Championships 2018. The work of 20 designers (19 from Glasgow and 1 guest exhibitor from Berlin) were included; 12 of which were special commissions. Every exhibit was for sale in-store and online. Featured in Dezeen, It’s Nice That and Design Week. The second of my articles on Modern Craft for The Skinny this autumn centres on craft discourses and motivations. In my latest article, I interview five contemporary practitioners in Scotland to ask for an insight into their practice. The impact of making by hand on wellbeing has emerged as a key motivation or end result for designer-makers. The discourse on craft is one of the most researched and contested in contemporary design. It’s also one of the reasons I founded Local Heroes. In my latest article for The Skinny, I wrote about how, 100 years after the Arts & Crafts movement saved or destroyed craft (depending on who you ask) we still collectively can’t reconcile or accurately define what or who is ‘doing’ craft. It’s a politically and ideologically loaded term. This article stimulated some really interesting discussions and is the first in a series on modern craft. With Scotland's design sector thriving, I interviewed international design critic Alice Rawsthorn about the success of countries with national design policies; our design culture and the growing opportunities for sustainability to be integrated into contemporary design businesses. For the full article please head over to my column in The Skinny. With the support of NHS Lothian's Art & Therapeutic Design programme, I completed a mentoring residency with Ginkgo hosted at Edinburgh’s Alt-w LAB. I have been exploring the implications of healthcare environments for patients in terms of their identity and sense of self and thinking about how design can positively counteract the depersonalising effect of clinical environments. Beginning with a design object – the ‘vanity' my research considered the accoutrements we surround ourselves with to sustain our 'best self’. My exhibit featuring the work of 17 practitioners, including Isabel Quiroga – whose vanity ‘Treetable’ is pictured – is part of the Re(a)d Bed exhibition at Edinburgh’s City Art Centre. My instagram series will display every piece from the show throughout May and June. In the second part of my survey of Scottish ceramics for The Skinny magazine, I introduced the work of five more ceramicists whose practice contributes to this remarkably fertile scene. To read the full article which features Andrea Walsh, Jono Smart, Scott Crawford, Sian Patterson, and Mella Shaw click here. Continuing the Local Heroes X The Skinny tour of Scottish design, my article in April’s issue is the first of two forays in 2018 into Scotland’s contemporary ceramics sector. The ceramics scene in Scotland is an eclectic and highly diversified field, both in character and use of materials. Read the full article here which includes the work of Skye’s Patricia Shone; Edinburgh’s Natalie J Wood and Fiona Byrne Sutton; and Dundee’s Steph Liddle. The Local Heroes instagram feed features regular #ScottishDesign posts across every sector – join the conversation. In March 2018, I looked at three Scottish projects using design and architecture in innovative, social ways. I was interested in exploring how contemporary Scottish architects connect with people in ways that are not restricted to typical building projects – such as fast-paced urban prototyping or audio archives of female architects’ experiences. Collaboration, both local and international, is a real strength in Scottish design. In February 2018 I wrote about three design partnerships creating exciting new products for 2018. 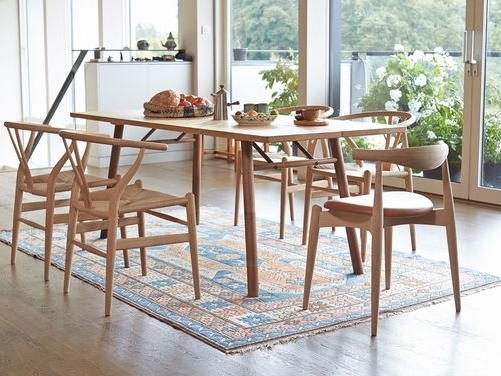 Pictured is Myer Halliday’s first collection for British furniture institution Heal’s. Here the Edinburgh-based designer’s Wave motif has been transferred onto the delicately proportioned Elgin chair (designed by Heal’s Senior Upholstery Buyer, Kris Manalo) as well as a cushion, lampshade and bowl. This was published in my regular design column for The Skinny – the extended version is online here. I'm undertaking a design residency hosted by Alt-w LAB. With the support of NHS Lothian's Art & Therapeutic Design programme, Alt-w LAB is hosting four mentoring residencies. I'll be exploring how healthcare environments have implications for patients in terms of their identity and sense of self. Starting with the idea of the ‘dressing table’, my residency will consider the accoutrements we surround ourselves with to communicate or sustain our 'best self', using the City of Edinburgh's art collection as a resource and reference point. Photo authors own: Fendi's 'Happy Room' at Design Miami (Dec 2016) designed by Cristina Celestino and curated by Maria Cristina Didero. My monthly column for The Skinny explores exceptional Scottish design. Beauty and Balance: Part 2 focuses on Scotland's flourishing contemporary jewellery sector and is in the January 2018 edition of the magazine. 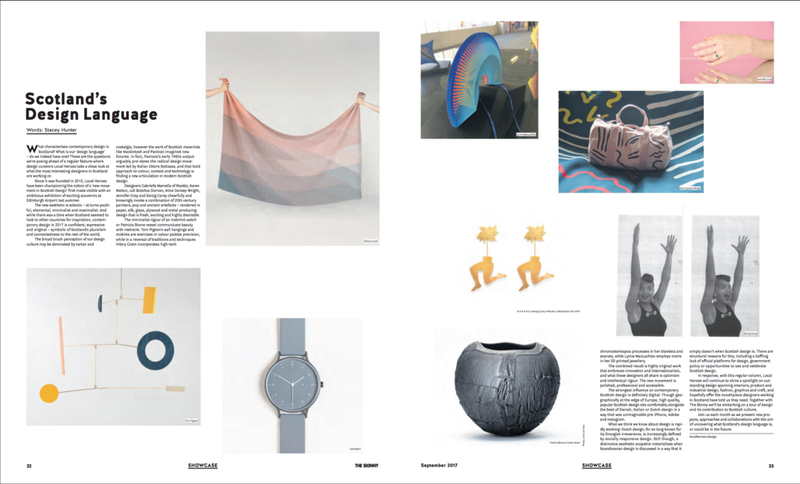 Part 2 features the work of Stacey Bentley, Tom Pigeon, Ruth Leslie, Kirsten Manzi, Heather McDermott and Euan McWhirter and is available to read online here. In December 2017, my monthly design column exploring #ScottishDesign for The Skinny featured exceptional jewellery design. The online version is available to read here. "A design language can be understood as not only an aesthetic characteristic but as a mood, attitude, perspective or process. The eclectic designers selected here all belong to Scotland’s flourishing independent jewellery design scene. In their own highly individual way, each brings a refreshingly inventive spirit, lightness of touch or social commentary to modern jewellery." Pictured here is the Up Yours pin by Glasgow designer Freya Alder. 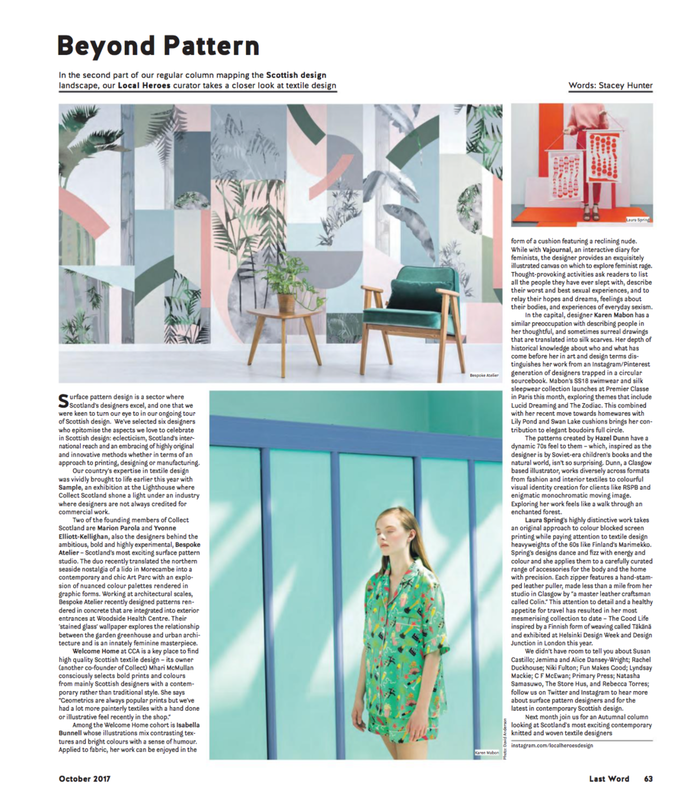 Beyond Pattern is the second article in my regular column mapping the #ScottishDesign landscape in The Skinny. In this feature I explore the work of Scotland's outstanding surface pattern and textile designers including: Bespoke Atelier; Isabella Bunnell; Karen Mabon; Laura Spring and Hazel Dunn. Read the online article in full by clicking here. This month my article on outstanding knitted and woven textile design was published in The Skinny – the extended online version is here. As an independent curator specialising in design, it's exciting and rewarding to present the work of designers that I hold in such high esteem. 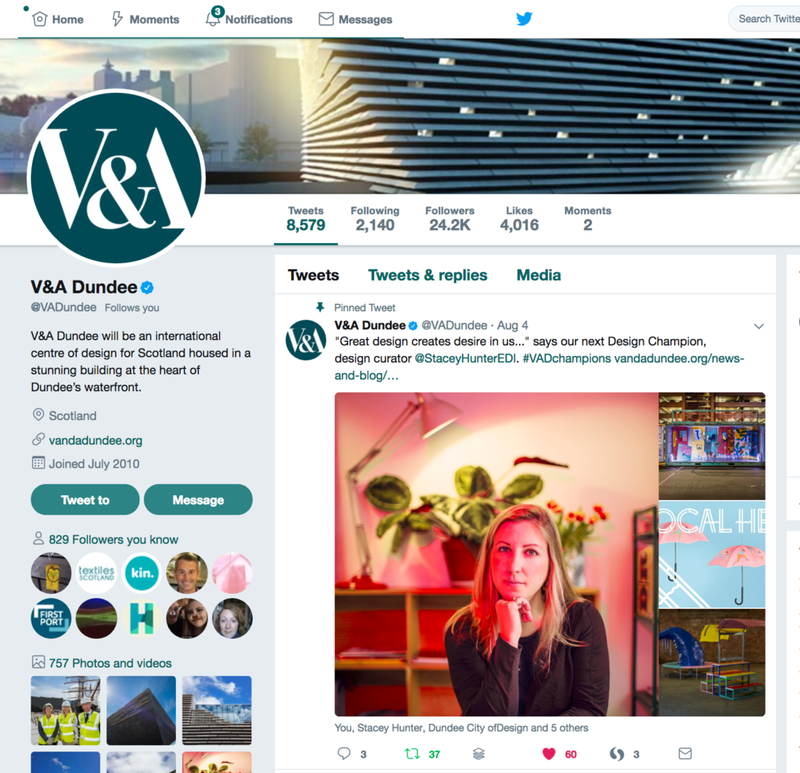 "We’re proud to welcome Stacey to V&A Dundee’s Design Champions, in recognition of her passion for championing Scottish design around the world – and how she’s creating opportunities for designers to work on new commissions, in meaningful and more radical ways." To find out more, please visit the V&A Dundee website. A major design exhibition at Edinburgh Airport, 1—31 August 2016. I initiated and developed the project for Scotland's Year of Innovation, Architecture and Design 2016. 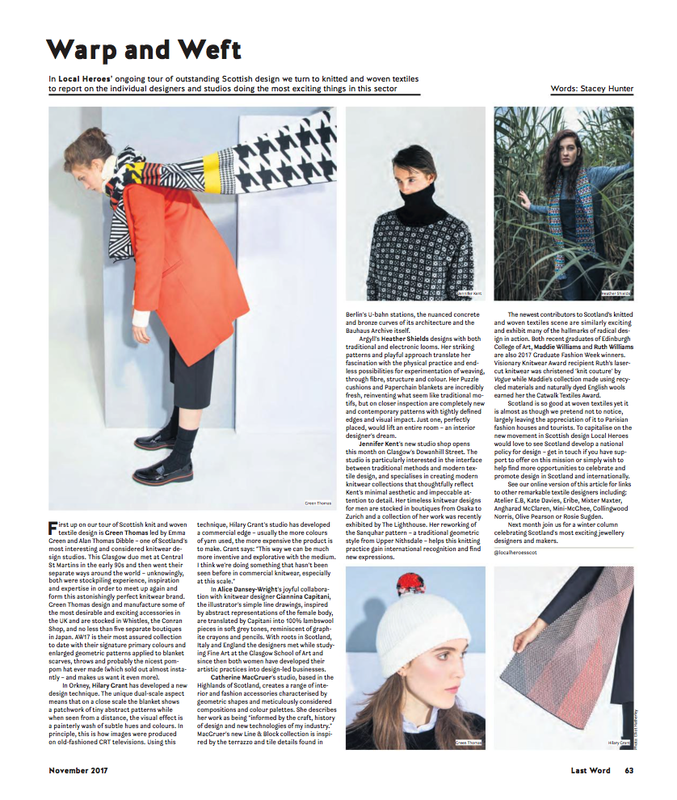 Scotland's Design Language is the first article in a regular column on design in The Skinny. September 2017 marked the beginning of an exciting journey for Scottish Design and my creative enterprise Local Heroes. What is Scotland's ‘design language’? Together with The Skinny I'll attempt to answer this question by embarking on a tour of design and its contribution to Scottish culture. My article for Craft Scotland explores the outstanding collection of Scottish design presented at this year's London Design Fair. In it I describe the work of 17 designers and makers from around Scotland. Each designer was selected to be part of the showcase by an expert panel and the result was a highly collectable, conceptually rich snapshot of contemporary design that pushed the boundaries of craft, its materials and its narratives. To celebrate their new project The Galvanizers, arts hub SWG3 invited me to develop a dynamic and progressive design project at 100 Eastvale Place in Glasgow’s west end. I commissioned design duo SLAPS (Giulia Fiorista and Ed White) to design 'Social Furniture' for an open space with the Scottish climate in mind producing exciting, unique and expressive propositions. The Glasgow-Rella and Calm-Tree were unveiled on June 30th 2017 at the launch of Hypermarket. The exhibition featured exciting new commissions which explored the notion of the souvenir and the theme of travel. Installed at Edinburgh Airport during the largest cultural festival in the world — The Edinburgh Festival — Local Heroes was accessible to a predicted 1.2 million passengers spanning 120 international destinations. My postdoctoral fellowship research title was 'What We Talk About When We Talk About Gentrification: Crafting an Effective Agenda for Public Officials'. IASH at the University of Edinburgh is a unique institution founded in 1969 to promote creative and interdisciplinary thinking across the humanities and social sciences. 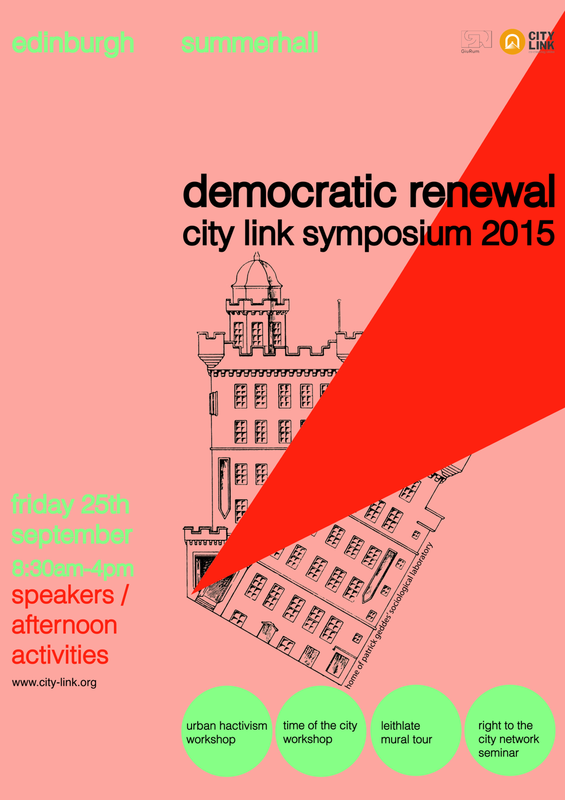 The City Link Symposium: a celebration of cities and the people and activity that shape them. Programme director, 2015. Score Tae The Toor is a book and CD publication release inspired by the Concrete Antenna sound installation at Edinburgh Sculpture Workshop created by Simon Kirby, Tommy Perman and Rob St John. I was one of seven writers asked to write pieces inspired by the tower and the installation, with pieces covering architecture, memory, archives, urban ecology and public art. October 2014 — 2016 The New Metropolitan - I co-founded a web-magazine about new cultures of urban citizenship. Working with a network of researchers I commissioned content, design and events. 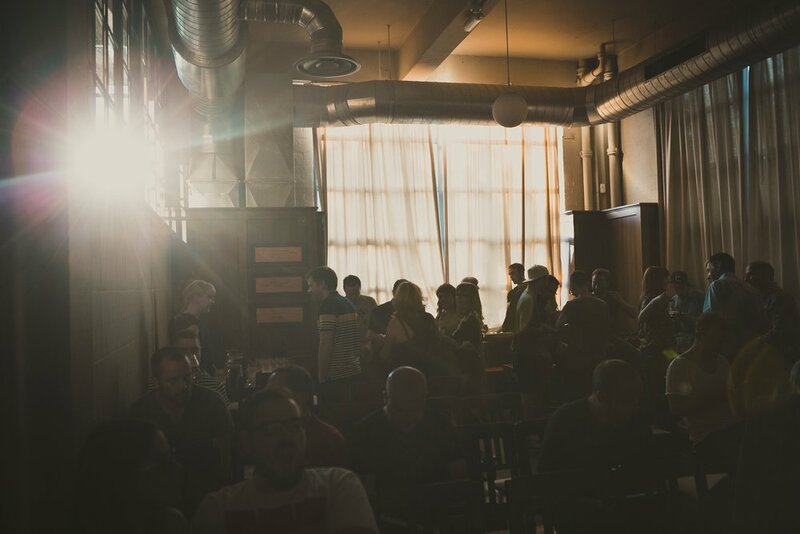 Our first event Amsterdam, Street Art & Gentrification with Christoph Lindner considered some of the unexpected ways in which artistic attempts to foster hospitality and belonging at a community level can produce new, subtle forms of exclusion and false intimacy. Join the conversation here | Tweet us @new_met | The Facebook page is here. An exhibition of innovative Norwegian design for extreme weather conditions. Presented by the Six Cities Design Festival (Programme Manager) at Aberdeen Art Gallery; supported by Norsk Form & the Norwegian Design Council, the Scottish Executive and The Lighthouse, Scotland's Centre for Architecture, Design and the City. I organised service production for fashion magazine Mr Porter for a shoot featuring John Byrne. Crew assembled by Location Scotland. 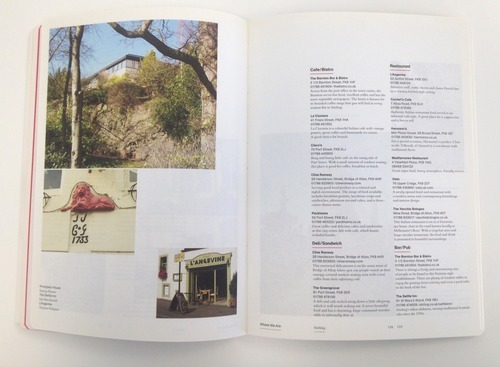 I reviewed The Language of Towns and Cities for international architecture magazine ICON. Read the article here. I project managed the service production for a three-day shoot in various locations in Scotland. I styled this photoshoot for Edinburgh based designer Namon Gaston. Photo by Stuart McClay. I was invited to contribute to a chapter about architecture and urbanism titled Scotland’s Ambiguous Urbanism. Buy at Word Power books.